Corn, soybean, spinach leaf, and tomato aquaporins have been shown to share homology with human aquaporin-4, which is abundantly expressed by brain astrocytic endfeet. Thus, antibodies formed against the dietary aquaporins may potentially cross-react with brain aquaporin, leading to blood-brain barrier permeability and setting the stage for neuroautoimmunity and neurodegeneration. Here, we review the role of aquaporins in plants and humans in maintaining a healthy organism and mechanisms by which dietary aquaporins may contribute to neurological disorders. We include clinical data on the correlation between four real-world, dietary aquaporin and five neurological tissue antibodies. Our findings showed the percent of neurological tissue antibody production increased with the number of positive food aquaporins. Of the four food aquaporins, spinach was the most common reactive. Of the neurological tissues assessed, tubulin was the most common positive. Patients with antibody reactivity to dietary aquaporins may consider abstaining from the aquaporin-containing food in order to prevent neurological tissue damage. Neurological disorders including Alzheimer’s disease, multiple sclerosis, and autism spectrum disorders are devastating, not only to the patient but also to the family and loved ones of the afflicted. Any simple lifestyle choices that could prevent the onset of neuroautoimmunity should be investigated. Diet is a controllable lifestyle choice. The identification of offending foods can play a role in the prevention or arrest of neuroautoimmune reactivity. Specific foods have been shown to play a role in certain neurological disorders. Indeed, nutrition and dietary strategies are being investigated or recommended for Alzheimer’s disease [1, 2, 3], multiple sclerosis [4, 5, 6], and autism spectrum disorders [7, 8, 9]. In a previous study , we demonstrated the correlation between the production of gluten-family protein, dairy-family protein, and lectin/agglutinin antibodies and the reactivity to self-tissues. The number one targeted tissue for each food group antibodies was neurological. One of the major components protecting the nervous system is the astrocytes. Using its endfeet, which express an aquaporin (AQP), one of the astrocyte’s roles is the support of the blood-brain barrier (BBB). Due to the antigenic similarity between plant and human AQPs, antibody immune reaction against food-based AQP can result in neuroautoimmunity. Circulation of these food AQP antibodies alone may not result in autoimmune disease, but a breach of the BBB allows for these, and other circulating pathogenic antibodies, to enter the nervous system and induce neuroautoimmuity. AQPs have been studied extensively in neuromyelitis optica [11, 12, 13, 14, 15]. 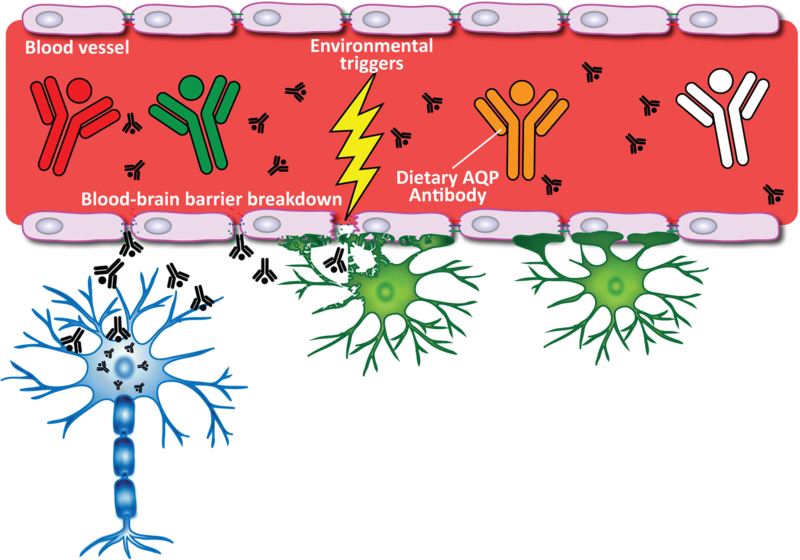 Here, we review the functions and similarities of food and human aquaporins, the role of human aquaporin in the protection of the brain and nervous system, and the neuroautoimmunity that can occur when the blood-brain barrier has been breached. Moving water is the fundamental life-giving force on Earth. Without it, every living thing would perish. While life-giving, too much water can bring death. Most living terrestrial beings have aquaporin within them. AQP regulates the flow of water into, or out of, the organism, in order to optimize the well-being of the life form. Aquaporins (AQPs) are membrane channel proteins [16, 17]. They were first identified in soybean  as transporters of water, thus the name; however, later research found that these channel proteins facilitate the transport of boron, silicon, or carbon dioxide [16, 17]. Thus, in plant research, the term aquaporin has been replaced with major intrinsic proteins (MIPs) to embrace the array of transported substrate necessities . AQP is expressed in roots and leaves of many plants in order to take in water when needed. In times of drought, the aquaporin channels in the leaves are closed to transpiration, in order to conserve water . Conversely, when too much water is in the soil, the root-based AQP channels are closed to the intake of water. Like plants, humans have AQP water channel proteins. The first, aquaporin 1 (AQP1), was discovered in 1992 . The human aquaporin often researched in neurological disorders is aquaporin 4 (AQP4). It is the most abundant water channel protein in the nervous system and plays an important role in BBB defense. Although AQP4 is concentrated in the astrocytic foot process, it is also expressed, at lower concentrations, in other organs including the lung, thyroid, and stomach [20, 21, 22]. In the brain, AQP4 plays a role in neuroplasticity , the removal of waste from the brain , and the control of water into and out of the brain . Indeed, the expression of AQP4 is greatly increased during cognitive stimulation, showing that it plays a positive role in neuroplasticity . AQP4 serves as a trash chute for the removal of waste out of the brain and into circulation, where it can be processed and eliminated from the body . And, as the name implies, AQP4 transports water into the brain but also moves water out of the brain in times of edema . Bestowed with a variety of protective properties, AQPs are vital to maintaining the health of the living being. 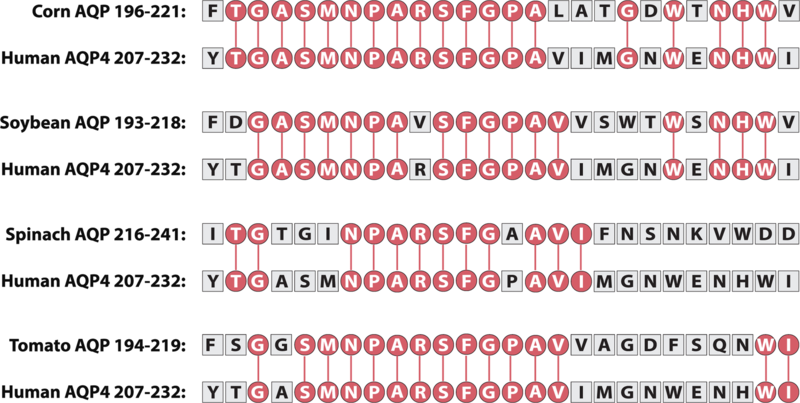 Vaishnav and colleagues  did an elegant job of identifying the shared amino acid sequences of human and plant AQPs. Corn (maize), soybean, spinach leaf, and tomato AQPs have homology to AQP4 (Fig. 1). Shared structural homology between dietary proteins and human tissues can result in autoimmune reactivity in genetically susceptible individuals. Due to a similarity in structure, if antibodies are produced against a dietary protein, such as spinach leaf AQP, those spinach leaf AQP antibodies could potentially mistake AQP4 in the astrocytes for spinach leaf AQP. This mechanism of cross-reactivity, instigated by a dietary protein, and igniting an attack on self-tissue, as if it were foreign material, is illustrated in Fig. 2. Cross-reactivity between dietary AQPs and AQP4 is concerning. Antibodies made against food AQPs were shown to react to AQP4 in patients with neuromyelitis optica (NMO) a subtype of multiple sclerosis (MS) . Dietary AQPs are resilient. They can withstand dramatic temperature changes involved in food preparation, surviving the cooking process . Therefore, food AQPs reach the gastrointestinal (GI) system as whole proteins. If they are antigenic to the consumer, antibodies will be formed. As discussed, these antibodies may attack self-tissue. Being that AQP4 is also expressed in the stomach , the ingestion of corn, soy, spinach, and tomato may even contribute to GI barrier breakdown. A breakdown of the GI barrier allows for the rapid transport of large, antigenic material from foods, bacteria, and other gut-related proteins, into circulation. Antibody formation follows. Excessive antibody production may lead to systemic inflammation, followed by autoimmunity as circulating antibodies may cross-react with self-tissues. A broken GI barrier has been shown to put the body at risk for autoimmunity [28, 29, 30]. Systemic inflammation and autoimmune reactivity may target the BBB, putting the brain and nervous system at risk for neuroautoimmune reactivity. The connection between the breakdown of the gut barrier leading to the breakdown of the BBB has been established [31, 32, 33, 34, 35]. Our focus on AQP4 centers on its vital support of the BBB. The BBB serves as a physical barrier between the brain and the circulating blood. Its structure is formed by the arrangement of endothelial cells and tight junctions that line the capillaries, which supply blood to the brain. It is a highly selective barrier that restricts the movement of all soluble proteins greater than 400 Da from the blood across to the brain. Acting like a sieve, the BBB protects the brain from dietary antibodies, the products of enteric organisms such as lipopolysaccharides (LPSs), and toxic chemicals, etc., that circulate in the blood. The BBB naturally permits the passage of essential metabolites, small hydrophobic molecules like oxygen, carbon dioxide, hormones, etc. On the brain side of the BBB, the barrier is enwrapped by the endfeet of astrocytes. By connecting their endfeet to the BBB endothelial cells and pericytes, astrocytes form a secondary layer of protection [36, 37]. A breach of the BBB can occur due to a variety of environmental insults including emotional stress , systemic LPS [39, 40], repetitive head jarring as seen in some sports , traumatic brain injury  as seen in motor vehicle accidents, concussions, and other physical impacts. The astrocyte structure must be secure in the event of a break in the BBB, to provide a secondary barrier. However, this leaves no protection for the astrocytic endfeet. Due to the concentrated expression of AQP4 in the endfeet of astrocytes, they are vulnerable to circulating food AQP antibodies. If antibodies against corn, soy, spinach, or tomato AQPs are circulating in the bloodstream during a breach of the BBB, those antibodies may attack AQP4 and thereby destroy the secondary layer of protection for the brain. AQP immunoglobulin (Ig) G was shown to compromise astrocytic endfoot integrity [43, 44]. The result was a broken BBB, dysfunction of synaptic microenvironments, and autoimmune astrocytopathies. See Fig. 3. In pathogenesis, AQP4 plays a role in astrogliosis and the secretion of proinflammatory cytokines . AQP4 has the distinction of being a target of autoimmunity in the pathogenesis of astrogliosis or NMO spectrum disorders [26, 45, 46]. Here, AQP4 antibodies bind to astrocytes contributing to the pathogenesis of NMO and related disorders . Furthermore, AQP4 antibody levels were shown to increase previous to disease relapse , which supports the role of AQP4 antibodies as a mechanism of pathogenesis. NMO is more commonly found in Asian countries. It is speculated that this phenomenon occurs due to the increased consumption of soybean and spinach by these populations . Neuropsychiatric disorders related to AQP4, as accumulated in an excellent review by Xiao and Hu , include Alzheimer’s disease , depression , drug addiction , and Parkinson’s disease . When the BBB is damaged, it provides an unguarded entryway for environmental triggers to infiltrate the brain and nervous system. As illustrated in Fig. 2, due to the similarity between some of these triggers and neurological tissues, neuro-reactive antibodies can be formed. The greater the number of circulating autoreactive antibodies during a breach of the BBB, the greater the potential damage to the nervous system. As neuronal tissues become damaged, their entry into circulation ignites antibody production against self-tissue. Neuronal autoantibodies contribute to the onset of neurological diseases. Known cross-reactions between neurological tissues and environmental triggers include a variety of food proteins and pathogens. The glycosphingolipid, asialoganglioside, has been shown to have cross-reactivity with gliadin , Campylobactor jejuni lipopolysaccharides , and streptococcal proteins . Cerebellar neurons, called Purkinje cells, have been shown to have cross-reactivity with gliadin [54, 57] and milk butyrophilin . Nerve sheath tissue, myelin basic protein, has been shown to be cross-reactive with gliadin , Chlamydia pneumoniae , herpes-6 , and streptococcal protein [58, 59]. Myelin sheath adhesion molecule, myelin oligodendrocyte glycoprotein, has been shown to cross-react with milk butyrophilin . Synapsin, a regulator of neurotransmitter release, has been shown to have cross-reactivity with gliadin . And finally, the building block protein, tubulin, has been shown to cross-react with streptococcal protein . Neurological disorders associated with antibodies against the above-cited self-tissues include autism [60, 61], chronic inflammatory demyelinating polyneuropathy , demyelinating diseases [63, 64], gluten ataxia [57, 61], Guillain Barré syndrome , inhibited neurotransmitter release , Miller Fisher syndrome , motor neuron disease [62, 66], multifocal motor neuropathy , multiple sclerosis [58, 64, 66, 67], myasthenia gravis , pediatric autoimmune neuropsychiatric disorders associated with streptococcal infections (PANDAS) , paraneoplastic cerebellar degeneration syndrome [57, 68, 69], and sensorimotor neuropathy . A host of neurological disorders is possible if the BBB is broken. The question of the chicken or the egg was posed by Vojdani et al., in a study of specific antibody production in patients with multiple sclerosis . They found elevated serum antibodies to both human and plant AQPs. 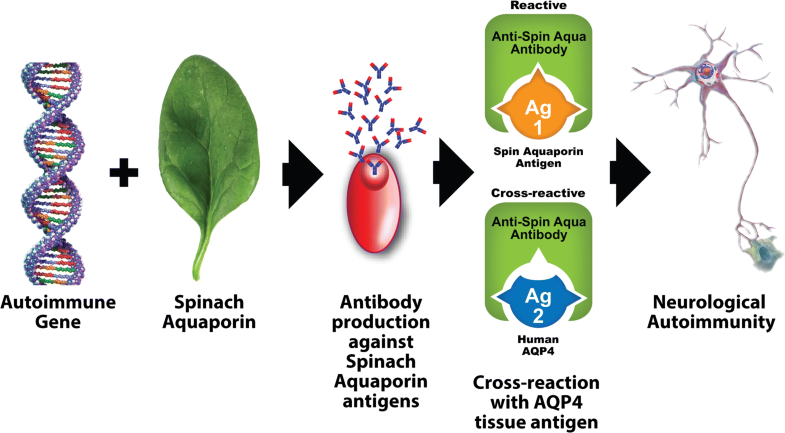 The authors speculate on the known cross-reactivity between human AQP4 and AQP from corn, soybean, spinach, and tomato, asking are the plant aquaporin antibodies elevated because the BBB has been breached and human aquaporin antibodies are cross-reacting with the food AQPs, or were circulating plant AQPs attacking human aquaporin once the BBB was broken and astrocyte endfeet were exposed? Either scenario is possible. In the first scenario, astrocytic endfeet are damaged, releasing AQP4 into the blood stream. 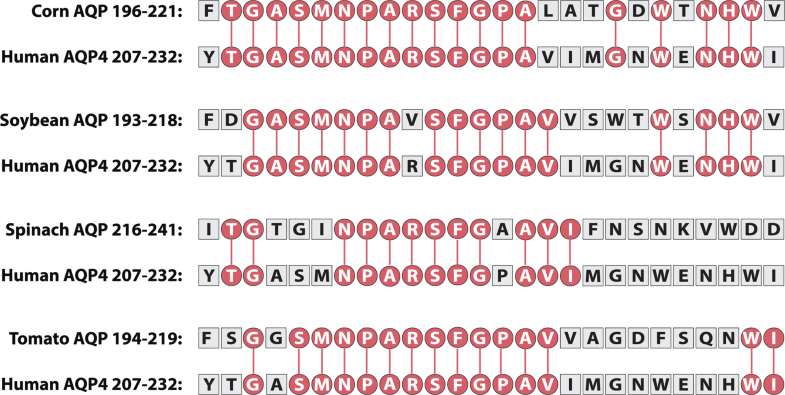 Antibodies against AQP4 are formed. The innocuous plant AQPs consumed may be targeted by the AQP4 antibodies. This is a display of human AQP4 mistaking, or cross-reacting with, plant AQPs. The second scenario occurs when the initial antibody immune reaction was against ingested food AQPs. AQP antibodies circulate in the bloodstream. Once a breach of the BBB occurs, these circulating AQP antibodies mistake human AQP4 for food AQP and attack the self-tissue. This is food protein antibody cross-reactivity with human tissue protein. If food AQP antibodies contribute to the breakdown of the BBB, the presence of these antibodies should precede the onset of neuroautoimmune reactivity (Fig. 4). 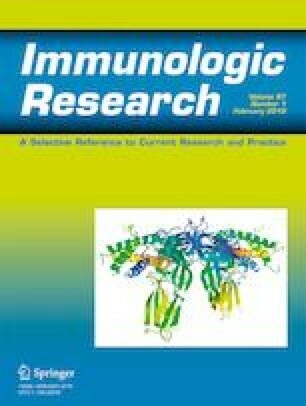 To better understand the risk of neuroautoimmunity in the presence of circulating antibodies against food aquaporins, we assessed IgG + IgA immune reactivity against real-world dietary exposures of cooked corn + corn aquaporin, soybean oleosin + soy aquaporin, raw spinach + spinach aquaporin, and raw tomato + tomato aquaporin, simultaneously with IgG + IgA immune reactivity against asialoganglioside, cerebellar, myelin basic protein, alpha + beta tubulin, and synapsin. Testing was performed by Cyrex Laboratories, LLC, Phoenix, Arizona USA. Enzyme-linked immunosorbent assay technology, as previously described , was used for all assessments. Specimens were run in duplicate to ensure reproducibility of the results. Variations in optical density (OD) between duplicate wells were less than 20%. 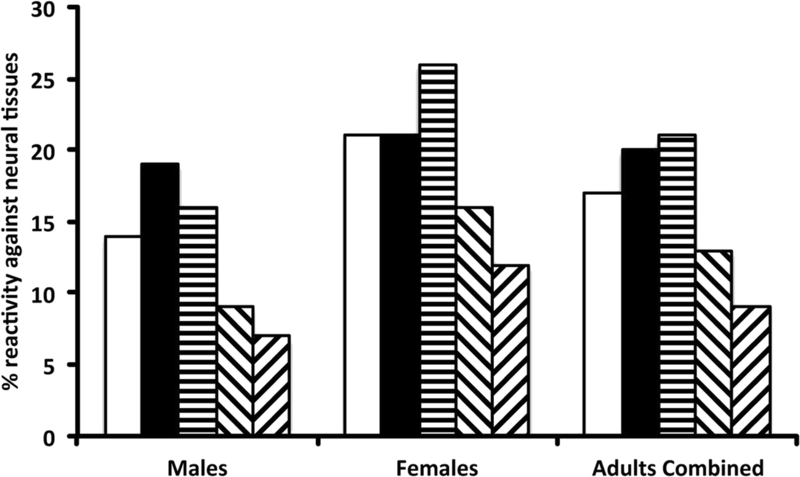 When 577 patients were assessed simultaneously for food and neuronal tissue reactivity, a total of 136 adult (19 years or older) subjects tested positive for at least one food + aquaporin (Fig. 5). We randomly selected 86 (43 male and 43 female) for gender comparison. We then compared the food testing results of these 86 individuals with their tissue antibody results. The most reactive food containing aquaporin reactivity was spinach (79%), followed by corn (64%), tomato (37%), and soybean (26%). 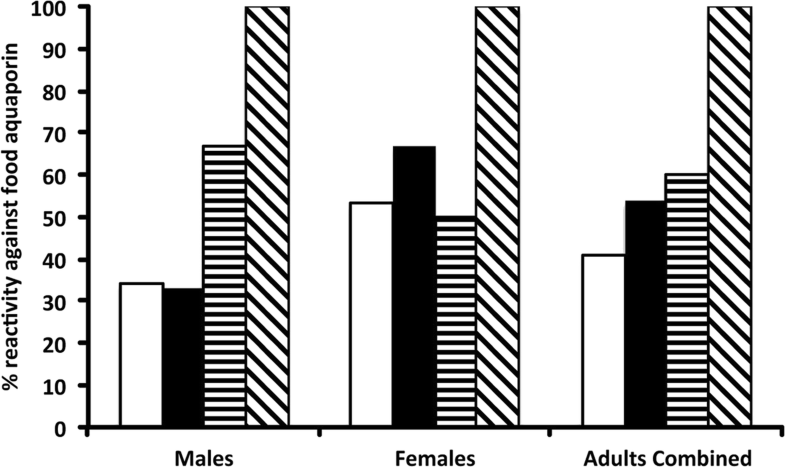 Variations were seen in results between adult males (ages 19–77) and females (ages 19–74). In males reacting to 1, 2, 3, or 4 food aquaporins, 34%, 33%, 67%, and 100% respectively reacted to one or more neurological tissues. While in females reacting to 1, 2, 3, or 4 food aquaporins, 53%, 67%, 50%, and 100% respectively reacted to one or more neurological tissues. However, the combined adult results revealed an increase in neurological autoimmune reactivity with an increase in the number of positive reactions to food aquaporin antigens. In adults reacting to 1, 2, 3, or 4 food aquaporins, 41%, 54%, 60%, and 100% respectively reacted to one or more neurological tissues. Females had more reactivity to neurological tissues than males. Results showed MBP (14% males, 21% females), asialoganglioside (19% males, 21% females), alpha + beta tubulin (16% males, 26% females), cerebellar (9% males, 16% females), and synapsin (7% males, 12% females). Combined results revealed the most to the least common neuronal tissue reactivity as alpha + beta tubulin (21%), asialoganglioside (20%), myelin basic protein (17%), cerebellar (13%), and synapsin (9%). Clearly, the more reactivity to multiple food AQPs, the greater the possibility for neuroautoimmune reactivity. However, even a 41% chance for immune reactivity to self-tissue, as seen in the adult reactivity to one food AQP, is significant, especially in patients with a family history of neurological disorders. The known cross-reactivity between human AQP4 and corn, soybean, spinach leaf, and tomato AQPs, coupled with the knowledge that a broken BBB is the invitation for neuroautoimmunity, leads to two conclusions. First, if a healthcare practitioner is working with a patient who exhibits neurological symptoms, testing for food AQPs is warranted. A positive result, followed by the removal of the offending foods, may improve the patient’s clinical condition. Second, if a patient shows reactivity to food AQPs, specifically corn, soybean, spinach, and/or tomato, follow up antibody testing of BBB integrity and neuronal tissues should be considered. If BBB dysfunction and/or neuroautoimmune reactivity is detected, a lifestyle dietary change that includes the avoidance of the specific AQP foods may prevent, slow down, or arrest the pathogenesis of neurodegeneration. A small number of patients were included in this study. 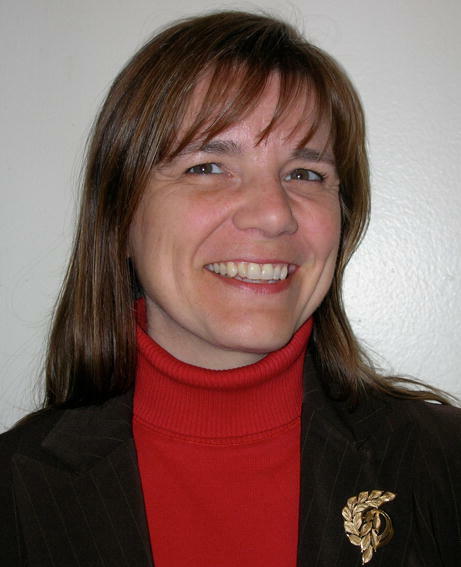 Larger studies on food AQP and other food proteins that mimic neuronal tissues need to be performed to better understand the role of food in the pathogenesis of neurological disorders. The authors wish to thank Thomas Berube and Joel Bautista for their assistance with the figures included in this article. The testing was performed by Cyrex Laboratories, LLC for which Jama Lambert works. Lambert J, Vojdani A. Correlation of tissue antibodies and food immune reactivity in randomly selected patient specimens. J Clin Cellular Immunol. 2017;8(5). https://doi.org/10.4172/2155-9899.1000521. Alves Do Rego C, Collongues N. Neuromyelitis optica spectrum disorders: Features of aquaporin-4, myelin oligodendrocyte glycoprotein and double-seronegative-mediated subtypes. Rev Neurol (Paris). 2018. https://doi.org/10.1016/j.neurol.2018.02.084.